Get free Gatorskin tires with any purchase of a CHANGE 702 commuter bike. Don’t ride anyplace with thorns, broken glass, tacks, potholes or anything else that eventually shows up on the road. Today, we have four layers of technology applied to tires to solve different problems, from the all-weather, well-wearing, gripping surface to 180 threads/inch Kevlar casing to stop punctures. That brown layer is Kevlar–the stuff that stops bullets. Available in several sizes, we have settled on the 28mm version of Gatorskin as the best match for the CHANGE 702 folding full-size commuter bike. We have ordered these by the dozen, at about $80 per set, to give away for FREE with each CHANGE 702 commuter bike ordered. 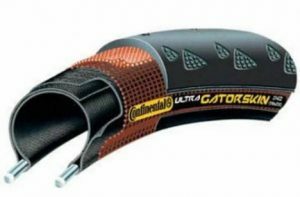 Just write GATORSKIN in your order notes, and you just got yourself a free upgrade to puncture-resistant tires, while supplies last. (NOTE: This inventory ran out in December 2018).